It’s mayhem down on the farm – the chickens have escaped and they’ve made themselves a precarious perch on the roof, with hay bales and wagon wheels! 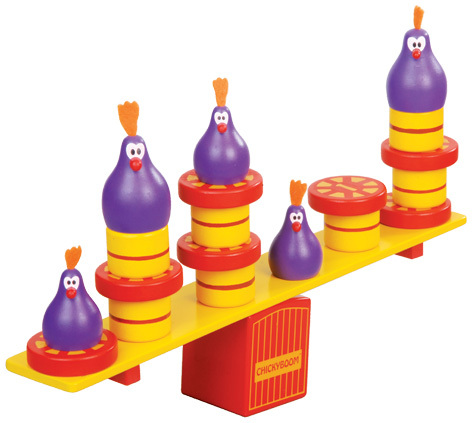 It’s your job to round up those chaotic capons – can you get the chickens, wagon wheels and hay bales off the rocking perch without making it topple? Be careful because when one moves everything starts to wobble! Will you go for the high scores or are you too chicken? 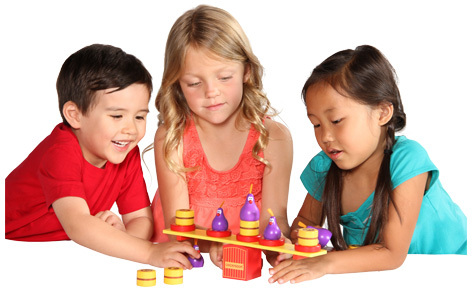 The pieces in this counting game have different weights and point values making it a fun strategic game of balance and counting that develops both hand eye coordination and fine motor skills through balancing and weight assessment. In the end, the player who has collected the highest amount of points wins the game! This traditional style all wooden balancing game is sustainably made by Blue Orange, who plant two trees for every one used in their games. Please tell us what you think of Chickyboom by Coiledspring Games. Great fun for any young kids! You need a good steady hand calm nerves as you play this game its lots of fun as you remove wheels, hay-bales ect off the balance board collecting points along the way. This game is good for hand eye co ordination,strategy and maths. A great game for all the family with a very wide age range.